May the force be with…your wallet? Yes, Star Wars fans, gather your coin and prepare to bid on this dazzling solid gold Darth Vader helmet that’s about to go up for auction in Japan. What’s that? How much, you ask? Well, you gotta pay the cost to be a memorabilia-owning boss, so bidders should prepare to drop a cool $1.4 million on this one-of-a-kind, 24-karat-gold geek’s dream come true. There’s no doubt that we’ll always have a special place in our hearts for the now-famous Chewbacca mask, but you don’t have to be a lightsaber-toting, Last Jedi-obsessed fan to be extremely impressed with this blinged-out headpiece. According to The Daily Dot, the life-size helmet was created as a part of a collection of gold memorabilia to commemorate the 40th anniversary of the first Star Wars film, A New Hope. 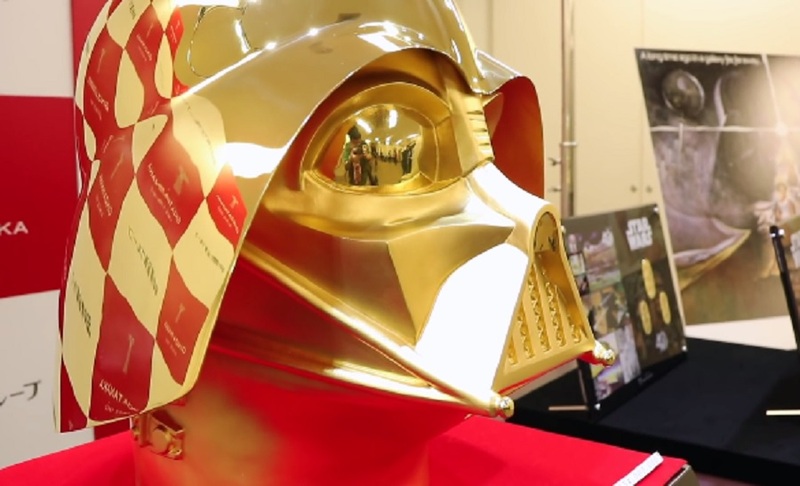 The helmet weighs 33 pounds (whoa) and will go up for sale at Ginza Tanaka in Tokyo on May 4, also known as Star Wars Day. In 2015, the jeweler who created the gold Darth Vader helmet refused to divulge how much it cost to create it and wouldn’t make it available for sale. According to Reuters, the mask was supposed to be handed off to Disney, but lucky for you, dear Star Wars lover with a million dollars to spare, that didn’t happen. So, if you want what are perhaps the most coveted bragging rights among Star Wars fans, this mask could be yours for the right amount (read: A LOT) of money.